If you ever lived in New York City and heard former Mayor Michael R. Bloomberg speak Spanish, then you were in for a treat. Every year, millions of people make learning a new language one of their New Year’s resolutions. What many people fail to realize is how challenging that endeavor is. Flashcards, classes and books can be a waste of time in a sense because learning how to speak a language comes from immersion. You have to speak it, consistently, daily, and often to retain vocabulary, sentence structure, accents and grammar. While there are excellent apps already available, Hello Pal intends to change the game by offering a new route to get to the same destination. Hello Pal allows you to select from any of the users on its network to engage in a conversation with. You can text the person, speak to the person and even look through built in phrase packs. 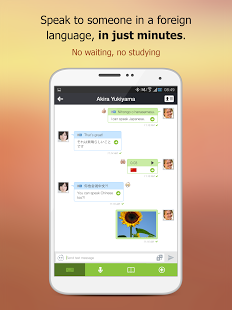 When you chat, the words used by you are automatically translated. In the case of text, you can send a text and the user will receive it in their language and vice versa. You can then click on a translator icon to translate what you sent. You will see the text translation and can even hear what is written. When signing up, you are given choice of linking your existing Facebook or Google Plus account to search for and invite friends. To our surprise however, there were plenty of people already on Hello Pal. You can see the flag indicating their country of residence and the language they speak. Hello Pall asks you in the beginning if you speak any other languages and your fluency level. We found Hello Pal’s interface very attractive and easy to get around. Chat windows are laid out across the top of the screen with other important information on the bottom. Icons are neatly designed and give a clear indication of its respective function. Tutorials are included which explain everything clearly. Even if you sign up with the intention of learning a specific language, you can still chat with other users and learn their native languages. We entered Spanish as the language we wanted to learn, but were able to locate Chinese users and communicate with them. When they texted us, we were able to see the Chinese translation, English phonetic pronunciation and we could even hear the phrases. Hello Pal promises to be a formidable alternative to the existing and well established language apps on the market. It is a different approach and even though the app is in its infancy stages, the amount of tools available within it makes it a very strong and entertaining contender. We love the fact that chats do not have to be in real time which allows you to use the app on your own terms and most importantly, the fact that you are not locked into learning just one language. That fact alone lets it stand shoulder to shoulder with its fiercest competitors.